The 2013 Walk to End Alzheimer’s in Sun City Center. 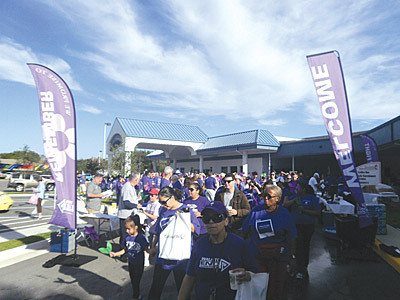 Nearly 350 people from the Sun City Center area are expected at the 2014 Walk to End Alzheimer’s event on Oct. 18 to raise awareness and funds to fight Alzheimer’s disease. Someone we love begins to experience memory loss, or may have trouble following a recipe for the first time. Or they have forgotten how to drive to the market, or they lose track of dates, have difficulty reading, stop in the middle of a conversation unable to continue, start losing their car keys, pay less attention to their grooming, may withdraw from a social or work life, or become depressed, or confused for no apparent reason. They could be showing the 10 symptoms of beginning Alzheimer’s disease, or dementia. Dementia is a general catchall term that demonstrates a person’s mental ability decline, which is interfering with their daily life. Dementia is not a specific disease. It describes a wide range of symptoms. Alzheimer’s disease is the most common form of dementia and accounts for some 60 to 80 percent of dementia cases. Vascular dementia, which occurs after a stroke, is the second-most-common dementia type. Alzheimer’s disease is not a normal part of aging, though most people who get it are older than 65, but it can begin as early as age 40. It impacts memory, thinking and behavior, and gets worse over time. There are more than five million people with Alzheimer’s disease in the United States, and more than 480,000 of them are Floridians. These numbers are expected to skyrocket to as many as 16 million people in the United States by 2050, according to the Alzheimer’s Association. The cost of care for those with Alzheimer’s and other dementias is estimated to total $214 billion in 2014, increasing to $1.2 trillion by mid-century, according to Natalie Kelly of the Alzheimer’s Association’s Florida Gulf Coast Chapter. Nearly one-third of all seniors who die each year has Alzheimer’s or another dementia, Kelly says. What is important to understand about the Alzheimer’s Association is that it is the global leader in Alzheimer’s advocacy, research and support. It provides a support system for those affected by Alzheimer’s disease or a related disorder and to their caregivers through patient and family services, education, advocacy and research. According to Kelly, the Florida Gulf Coast Chapter serves 17 Florida counties from Citrus County down to Collier County, where there are more than 153,350 persons living with Alzheimer’s. Only eight states have more cases of Alzheimer’s disease than there are in the Florida Gulf Coast Chapter’s service region. One service offered by Alzheimer’s Association here locally through the Gulf Coast Chapter is a 24/7 Helpline available by dialing 800-272-3900. If anyone has questions about Alzheimer’s disease or memory loss, or how the association can help, this is the place to call. They also can give caregiving tips and respite-care options. And they can give referrals in the local communities. Other services include care consolations, caregiver trainings, MedicAlert® + Alzheimer’s Association Safe Return® support groups. There are four support groups in Sun City Center alone. MedicAlert + Safe Return is a nationwide identification, support and enrollment program. If an “enrollee” is missing, one phone call can immediately activate a community support network. Other services include emergency respite care assistance, Caregiver’s Day Out, a lending library, community awareness, memory screening and the “Memory Mobile” service. Caregiver’s Day Out is a planned activity once a year organized by the local chapters of Alzheimer’s Association. Respite care is provided by local donors. It could be a cruise, a ballgame, or any other activity where area caregivers have the day off together. The Memory Mobile service is an outreach service that travels to low-income, rural or isolated groups, providing education, support and prevention services. Other services include: Alzheimer’s Association TrialMatch®, which helps people find clinical studies; Alzheimer’s Navigator®, a free online tool that provides individuals with Alzheimer’s and their caregivers step-by-step guidance and customized action plans; and an online Community Resource Finder providing instant access to community resources and services. Alzheimer’s/Dementia Hospital Wristband Education Project locally, which will be held from 9 a.m. to noon on Tuesday, Oct. 28, at Community Hall at 1910 S. Pebble Beach Blvd. in Sun City Center. It raises awareness among hospital personnel and first responders and is a special education opportunity. Medical professionals can register to receive a Certificate of Participation by calling SunTowers Retirement Community at 813-634-3347. Other participants are South Bay Hospital, St. Joseph’s Hospital – South, Hillsborough County Sheriff’s Office, Sun City Center Emergency Squad, Sun City Center Security Patrol and the Community Emergency Response Team. Gary Joseph LeBlanc is the founder of the Alzheimer’s/Dementia Hospital Wristband Education Project and weekly columnist for “Common Sense Caregiving.” LeBlanc will provide the education for the Oct. 28 event. To help provide these free services to individuals and families dealing with Alzheimer’s, the Florida Gulf Coast Chapter hosts its annual Walk to End Alzheimer’s®. In Sun City Center, the Walk to End Alzheimer’s is scheduled for Saturday, Oct. 18, at the United Methodist Church, 1210 W. Del Webb Blvd. Registration begins at 9 a.m. and the walk begins at 10 a.m. For more information, call Tiffany Kane at 727-578-2558, or email walk@alzflgulf.org. You can also go to their website at alz.org/walk. The Florida Gulf Coast Chapter is at 14010 Roosevelt Avenue, Suite 709, Clearwater, FL 33762.